This is the wonderful story of ABU. When he came, nobody had realized that he could not open this mouth, as all muscles in his face were totally atrophic: he suffered from a Eosinophile Myositis (Canine atrophic masticatory muscle myositis). Simply said: his mouth only opened 1 centimeter. He was very skinny and could only eat/drink if it was liquid. 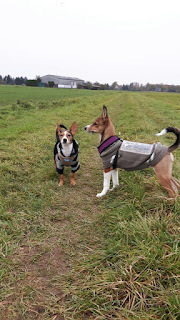 At Munich University a treatment with Prednisolon and Antibiotics was startet, and after 6 months he could take small kibble food, play with toys and run normally as he could breath better. I hope you all like these photos and encourage you to continue, even with cases like Abu.